I know, crazy times are upon us. Today I am in the mood for healthy food. Food you can love, love, love! Without all the chub, chub, chub! How about if we start posting these a bit more regularly!? Those are three things this girl needs a lot of. as part of my Facebook “Group”, things are changing up a bit. I have been working on setting up a Facebook Page to replace my “Group”. A bit confusing, I realize, but I think the Facebook Page will be a lot of fun. It offers more of an opportunity to chat. You can even post your own pictures of these recipes there. We will all applaud you! You can also have a link to each upcoming recipe sent to your email account by clicking here. Hang on tight, thanks for riding, and enjoy your day here at Lagoon. Help me Rhonda…I need more sleep. 1. Cut those chicken breasts up into 2 inch cubes. Combine the flour and the 1/4 t salt in a small bowl. Throw the chicken around in it until all of the pieces are covered. 2. Heat up a large skillet. When it's nice and hot add 1 T oil and throw your floured chicken into it. You understand that I don't mean throw it in like my friend Pam throws a softball. (Fast as a rocket, I tell ya.) Just toss the chicken in gently, now. We don't want you to rupture anything. 4. While your chicken is cooking up, chop up your veggies. Make sure they are about the same size. Don't get out your tape measure....just roughly about the same size will do fine. 5. When your chicken is pretty and golden, take it out of the pan and place it on a nice plate. 6. Add another T of oil into the hot skillet. Add your veggies and cook over medium high heat until crisp tender...about another 10 minutes. 8. When your veggies are crisp tender add your thickened sauce and chicken into the pan. Stir it all around and there you have it. Serve over a bed of rice. I've been wanting to make another stir fry. I haven't done one for a long time. This recipe looks perfect, plus I already have all the ingredients. I hate buying specialty products I only use once before it expires! 🙂 Thanks. Yummy! I love stir fry(and so do my hips! ).I'm up to 3 Diet Cokes a day(what happened to bedtime, anyway?). I stopped at Maverick and got my big ol' Diet Coke today. Ahhh, nothing like a Diet Coke fresh from the fountain at Maverick. Jamie Cooks It Up and Diet Coke- what would I do without them? I was actually going to skip over looking at your blog today because I am trying to eat healthier and I didn't want a yummy temptation staring at me, begging me to make it – bake it- and devour it. I was so excited to see a healthier recipe and the promise of more. Thank you, thank you! I made this tonight. MMMMMMMmmmmmm, LOVED it!!! Thanks for all the great recipes! 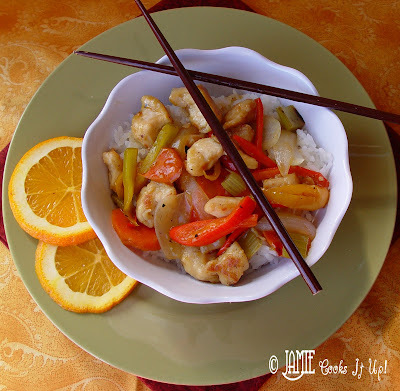 I like this healthier version of orange chicken! It looks fantastic. Huge hit at my house and a definite make again! Everyone loved it and even the veggies disappeared. Thanks again for all the wonderful Jamie Cooks It Up recipes. My family thanks you! Thank you for this healthier recipe. I've been trying to cut out sugar and all your yummy treats are just too tempting. I really appreciate good, healthy meals. I'd like to see more of those and a few less treats. Hey just wanted to give you a brief heads up and let you know a few of the pueitrcs aren’t loading correctly. I’m not sure why but I think its a linking issue. I’ve tried it in two different web browsers and both show the same outcome . I made this last night and it was awesome. I've been wanting to try it for a long time and finally got all the ingredients. It was perfect! I love your recipes. Thanks! Jamie – I'm so excited! I made this for my family tonight and all 3 very picky kids ate at least some part of it. That is a record for me. I did add baby corn, water chestnuts and orange zest and it was delish. Keep the recipes coming. You might just actually reform me into being a cook again. I found your recipe voer at Mommy's Kitchen. I made it a few nights ago and we loved it! no leftovers 🙂 Thanks for a wonderful recipe! this looks so good! im excited to try it. when you say 1/2 tsp ginger-do u mean fresh or the spice? thanks! The ginger used in this recipe is indeed the spice. Good luck! Hope you love it! This recipe is amazing!! Thank you Jamie. I have made five recipes so far from your blog and I couldn’t be happier – they all turned out wonderful. I’m can’t wait to try more. girlfriend. You just kicked Panda Express’s booty. Well played.